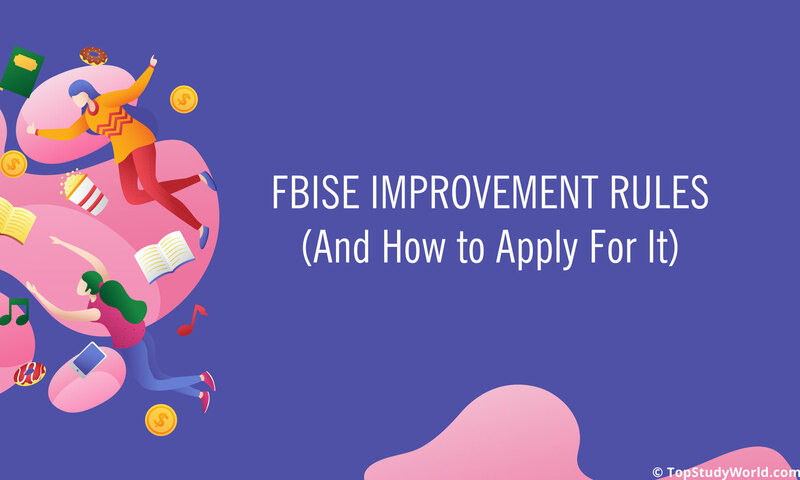 I know you must be feeling frustrated because you want to take the FBISE improvement exam, and you want to know the rules either you should take the exam or not. Grammar Tip: The student takes the exam, and the teacher gives the exam. Without wasting your time, let's talk about the rules. 1. HOW MANY OPPORTUNITIES DO I HAVE TO IMPROVE? Have you passed your 10th class or 12th class annual or supplementary exams? If yes, you are eligible for the improvement exam. If you have failed in any of the subjects, you do not qualify until you pass the exams. Moreover, you have only one opportunity to take the improvement exam. You have to avail the chance within one year after you have taken the recent 10th or 12th class annual or supplementary exams. 2. ARE HIGHER MARKS COUNTED OR LOWER MARKS? In simple words, your improved marks will be counted if you succeed to get higher marks than your previous result. What if you get low marks than your previous exam? Your higher marks will be counted that you have got in your previous exam. 3. CAN OTHER STUDENTS APPLY? If you belong to Punjab Board or any other boards of Pakistan, you are not eligible for the improvement exams. Only students of Federal Board are allowed to take the improvement exams for FBISE SSC and HSSC. 4. FOR HOW MANY SUBJECTS CAN I TAKE IMPROVEMENT? You can make improvements as many subjects as you want. You are not limited to two subjects as it was the case with the previous FBISE rules. According to the previous FBISE rules, you could take the improvement exams with the supplementary exams with maximum two subjects, but now you take with the annual exams only with SSC or HSSC for as many subjects as you want. Furthermore, you can take any number of subjects from any of the class you have passed. For example, you have passed 12th class. You can pick any number of subjects from 11th class and 12th class—even you can take all subjects at once for both class—and can improve the marks. That being said, you can improve the marks within one year of passing the examination. If you have passed SSC or HSSC in 2019, you have to take in 2020. There is no 2021 or 2022 opportunity. 5. DO I NEED TO TAKE THE PRACTICAL EXAM? You will not take the practice exams if you appear in one part of the subject. It means you will only take the improvement exams if you appear in both parts of the subject. For example, you want to improve your 11th Class Chemistry only, now you don't need to take your practical exam. But if you improve 11th Class and 12th Class chemistry at the same time, you need to take the practical exam. 6. WHICH SYLLABUS SHOULD I PREPARE FROM THE IMPROVEMENT EXAMS? I know you might be thinking about which course should I prepare for the improvement exams? You will take from the syllabus that you have studied even FBISE has changed syllabus for the subject you want to improve. Provided you improve your marks within one year when you pass your recent exams. 7. CAN 9TH AND 11TH CLASS STUDENTS TAKE THE IMPROVEMENT EXAMS? Unfortunately, it is sad news. If you have done 9th class, and studying in 10th class, and you want to improve your exams, then you are not eligible until you pass 10th class. The same goes for 1st year students, you can't take the improvement exam until you pass the 2nd year. You need to wait for a year.